After spending 15 minutes on the phone to my bank the nice lady asks me if I would hold on after she hangs up to take a short survey. Sure what’s one more survey to someone who lives them 24/7! After a couple of prompted button pushes to enter scores I get the chance to provide verbal feedback. I’m not the type to use circumlocution, I like to get straight to the point and I proceed with a relatively detailed account of a recent issue. I’m only half way through when I’m interrupted with a tone and told that the recording has ended. But I had so much more to say. Post call IVR surveys like this are popping up everywhere with more and more organisations using the approach to gather transactional customer feedback. The question is not whether they are possible, clearly they are, but whether they are useful. It turns out: much less so than you might think. In this post I compare post call IVR surveys to email invites for web surveys to see which is more effective. I also provide a checklist of things that you must do if you want to be successful. Here is a quick table of contents for this longish post. What is a Post Call IVR Survey? A post call IVR survey is an audio based survey that is normally used in contact centres. After the customer has interacted with the call centre agent they are transferred (automatically or manually) to a voice promoted survey system. The voice prompts provide the survey questions and the customer enters their response by the telephone keypad and/or by speaking their answers. Post call IVR data collection is generally easy to get up and running. If your IVR vendor supports the survey function you can set up a survey and start collecting data. If you’re looking to track simple agent level scores for customer satisfaction or Net Promoter Score® then a post call IVR survey is a simple way of doing it. But there’s pretty good evidence that you should not be giving front line staff score targets because it has a negative impact on culture and overall outcomes. This type of inbound transferred IVR survey appears to be low cost as there is no initial human interaction and no media costs. However, when you investigate a little more you realise the the costs to transcribe, code and evaluate the data are much higher than email surveys. You need to compare the total cost, not just the cost to turn the feature on in your IVR. Forwarding a caller to the survey requires no data to be collected. You don’t need email addresses or even cell/mobile phone numbers to receive the feedback. For organisations that have poor or limited data in these areas, that can be attractive. On a side note, wouldn’t it be a better idea to collect and validate the customer’s email address and phone number while they are still on the call in the first place. Then you’ll have this contact information for use in the future for, oh I don’t know, customer service or marketing? It is difficult to get public figures on the response rates for post call IVR surveys. There are lots of data about the completion rate being high but that’s the completion rate for people who agree to be surveyed. The chart below probably gives a better view of the overall completion rates by technology. As you can see online surveys may have a large number of “no responses” but when customers do respond they respond fully whereas many IVR surveys are only partially completed. Note also that the online response rates noted here are lower than the Net Promoter survey response rates we typically see of between 10% and 25% of all invites. Low overall response rates are caused by many things but an important one is that the survey must be done then and there. After the call customers may not want to wait around to complete a 2-5 minute survey. On the other hand they can do the email survey anytime they like and typically on any device they like. Experienced users indicate around 20% of responses include qualitative or text information. This significantly lower than the rates a well designed internet survey can generate of around 50%. If the only interface you had with your customers was via the phone then post call IVR survey may be perfect but you probably have many more touch points in your business. How will you measure your website experience, account manager calls, invoicing, delivery, etc? If you want to measure them, at the very least you will need to set up a separate survey process with separate data entry and the associate business issues. Why not simply run all surveys using the same platform? Another item not to be missed here is the survey bias that different survey methodologies can introduce into the score. Due to the ways that the human brain manages visual and verbal information it is likely that the scores on your IVR and other non-IVR based touch-point surveys cannot be validly compared. The score is just the score and basically not useful for much more than tracking progress. Qualitative information on the other hand is critical in determining how to drive continuous improvement in your business. While scores are interesting and provide a benchmark to track success it is the qualitative feedback that helps you to understand how to improve. 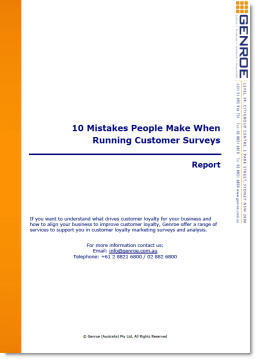 Post call IVR surveys do not handle this qualitative data very well for the following reasons. Capturing qualitative information is easy with post call IVR – simply record what the customer says. Unfortunately as a voice recording it is very difficult to use that information. Having staff listen to each recording is labour intensive and prone to long term apathy. So you need to convert that sound information to text information either by using speech to text software or having staff transcribe the recordings. At present software systems get it about 70% right. If you have ever received a speech to text SMS message you know that the accuracy of this software is subject to some “variation”. Plus, that still leaves 30% of the feedback from your customers missing. If your IVR doesn’t have speech to text processing built in this will add significantly to project complexity and costs. Of course, as soon as you have staff transcribing recordings the apparent cost benefit of post call IVR disappears quickly. If you have only a few pieces of qualitative feedback you can read and act on them. Of course if you are thinking of implementing post call IVR then you will have way more than a few pieces of feedback so that approach is not going to work. Manual tagging: This is where a person manually tags each piece of feedback based on what is in that feedback. This is a labour intensive process that is subject to human error and quickly gets old for the staff member(s) who have to do it. Passive machine tagging: uses software to read the comment and interpret what tags should be applied. This can work quite well but setting up and training the software is not a trivial matter. It is always more expensive and complex than the software vendors will admit pre-sale. In fact coding the data in this way is so difficult, even larger companies simply give up and code the data manually. Some amount of “gaming the system” can be expected in most surveys and post call IVR surveys are no different. Here the gaming can be as simple as not offering customers who are angry or unhappy the option of taking the survey. The survey invitation can be made a mandatory part of the agents closing scripts and emphasized in Quality Assurance reviews. The phone system can automatically re-direct all inbound phone calls to the survey at the end of the call. This eliminates the issue by removing the decision on whether to send a caller to the survey system. In reality both of these approaches are still open to being gamed but the issue can be minimised. Starting the small loop or Service Recovery process is a critical value add in the customer feedback process. This is difficult with post call IVR because they typically lack the alert systems that integrated customer feedback solutions offer. These integrated solutions enable the organisation to trigger and alert to staff when customers provide low score so they can commence the service recovery process. As you can see while Post Call IVR surveys can be used to collect data they suffer from a number of issues in enabling the organisation to use the data collected. If you are considering using this survey mechanism you should consider if the outcomes will be useful as well as cheap and easy. Transcribe the recordings so you have access to the text data for analysis. This can be done by people or software but it must be done. Tag the data using people or machines: neither comes cheap but it is required. Automate the sharing of the data amongst staff. Total transparency of data is one of the key planks of customer feedback success. I don’t usually take time to comment on blogs since everyone is entitled to an opinion. But when the opinion is based on an interpretation of facts that we (ServiceTick) have provided I feel moved to respond. By any measure I have seen IVR surveys have higher response rates than email or web surveys. Response rates for post-call IVR surveys can be 10 times higher than for email surveys. Post-call IVR surveys can handle qualitative information just as well (if not better) than email surveys. Real-time voice to text transcription means data can be gathered, analysed and used to trigger alerts. Our software has 95%+ accuracy across all accents. ‘Gaming’ can be simply prevented by a number of techniques including mandatory invitation to participate in the survey and regular review of scores by number of surveys completed by agent. Tagging of information can be delivered by simple verbatim analysis software. You can track all touchpoints using IVR by outbounding calls to customers. Alternatively use the medium that the customer used to contact you – email for email, IVR for telephone etc. It’s not a question of either/or – you should use a combination of methodologies to ensure you get maximum response and best return on investment from your feedback. And in that context post-call IVR has a crucial role to play. I fear that we must agree to disagree. As a vendor of these systems you of course feel that your approach is the best. That is understandable. We also re-sell a customer feedback system (CustomerGauge) but one that accepts all types of input not just IVR. The analysis in this post is based on my experience and on discussions with people and companies that have used post call IVR surveys. Response rates: To demonstrate your point perhaps you’d like to direct our readers to some research on the overall response rate not just complete rates for post call IVR surveys as it is not easily obtainable. Of course anything can be “10 times higher” in the right circumstances. In any case, above a useful threshold, response rate is not necessarily that important. Having a lot of data feels good but using the information is actually the most important element of the process. Easy of closing the loop, consistent data collection methodology, ability to compare scores by touchpoint, ability to analyse the data become paramount for success. This is where I see that this type of IVR survey falls down. I understand the quality of verbatims is better for email surveys as the respondents type their answers and you save that time. In all our projects email surveys are well below the response rate for IVR surveys. So we can not based our analysis only in Email surveys. I have never heard of a software with 95% accuracy in voice to text. Please could you let me know which software Thomas you are talking about? Gaming in the IVR survey will be always present, even applying different techniques, what we could do is minimize them. I do think that to some extent online survey will be the future as channel switching is happening as we speak, but It’s a slow process. Thanks for stopping by to comment and provide some more insight for the feedback community. We take a bit of a different approach with IVR surveys. We generate an autodialer call to the customer within 24 hours of the transaction. We get well over a 30% response rate and very useful data and comments. Also, the provider we use provides transcriptions of customer comments that we can scan, analyze, and take action on. Any customer that meets certain criteria such as “detractor” or “issue not resolved” is called back by a live agent within 48 hours to resolve the issue and determine root cause. I know people have issues with autodialer cals, but we get no complaints and actually find that customers welcome the opportunity to provide feedback. Also, they are usually “blown away” when they get a live call back about their issue. Thanks for taking to time to provide some more insights. The only issue I generally see with simple transcriptions is that you need to tag the data to make it “analyseable”. You are right customers are often blown away that you not only read what they said you actually took action. Imagine that! I agree that transcriptions are nearly impossible to analyse unless they are tagged or coded in some meaningful way. But I also find that the Market Research experts are always trying to come up with categorized results that can wash over the real issues. What we do is have the agents or managers that are calling customers back read the comments. They get a pretty good idea of what the trends are. Also, when the do the call backs they ask the 5 whys to determine root cause. At that point we tag the root cause, collect the data, report and take action. There is no substitute for reading through actual customer feedback. I personally scan the transcripts and read at least 30 – 40% of the negative comments. I stumbled across this article while researching pros and cons using an IVR survey for customer engagement. I work for a healthcare company and we currently only survey customers 3x/year in a manual telephone survey that seems to yield decent results. We haven’t had much success with e-mail surveys, for many of the reasons you state (the current e-mail addresses on file are few and far between). Do you have a suggestion on verbiage to use with customers to obtain e-mail addresses? That would be something we could easily incorporate into our scripting. Thanks for this article– your insight helps us a great deal when weighing both options. I don’t have specific words for obtaining email addresses but they are so ubiquitous these days that you should be able to drop it into your standard data quality check. When an agent is speaking with the person just have them check that all of the contact details are correct and if the email is missing simply have them ask for it. Some people will not provide it but that is uncommon. Interestingly, I often see the need to collect emails for NPS invites being a welcome driver for the business to start collecting this important contact detail that, to date, everyone agrees should be collected but no one has had the motivation. I responded to an IVR survey yesterday and made a mistake in the rating I gave for one of the questions. My initial thought was these systems must be prone to lower quality responses due to the speed. Comparing to a well setup survey that the user can read and take any amount of time to contemplate the appropriate response. Good point — I hadn’t considered the lower quality responses that might result as well. It well. Employees follow the lead of the leaders. •	IVR post transaction surveys have some of the highest response rates in the industry. We see outbound surveys having a complete rates between 25-40%. While emails and SMS response rate are falling in decline because of over sampling and “loading the email inbox” of consumers. •	Our research shows that IVR surveys often have the highest rates of open end responses, and when counting measuring the richness of the response “character count”, IVR surveys have between 2-5 times richer open end data then other survey modes. •	Analyzing IVR open end data does require speech to text capabilities, and with the near real time capability of these ASR models and extremely high word count accuracy, the analysis of qualitative data from IVR has the same challenges as other survey mode like e-mail, you need to code and analyze the data using text analytics tools. I could go on but my point is that brands evaluating survey modes for their consumer journey CX research needs to realize that one survey mode doesn’t fit all needs. We believe mix mode, and in the case of call center interaction, IVR voice surveys are a preferred survey solution. Thanks for stopping by and commenting, not withstanding that your businesses is very voice centric and so your perspective might be expected. Just on response rates: we see rates in the same area for email invites to surveys so perhaps that is a push between the modes. If you’d care to share public results I’d be happy to update the post. – tagging of all commentary (manual, or computer based) is required for effective collating and driver analysis. Those two items require bigger budgets and, often, specialist resources to manage the process. The problem is, they are rarely properly implemented. More often, organisations turn on the post call IVR survey option from their PBX supplier, add a new menu item, and start collecting data. Said data then collects in a big pile of audio files no-one listens to and the ONLY outcome is a score to put on a corporate dashboard. I think you would have to agree, this is not effective. By the way – web based text tagging can be done very effectively and simply. The NPS system vendor we use (CustomerGauge) have a simple approach to tag the data accurately for use in driver analysis. Thanks for this helpful post. I’m wondering if you can point to any data about whether post-call surveys are as effective (or effective at all) if the agent **doesn’t** prompt the caller to hold on for the survey. I would assume that most people would hang up before even being aware that the survey option is there. It’s a bit hard for me to test how this would play out as we don’t have the tech in place just yet. Any data/insights you are aware of would be most helpful. Matthew – I really don’t have any specific information in this area. Although, I expect that if you don’t tell people to stay on the line the response rate will plummet (even more than normal). My only suggestion would be to test both scenarios, but you indicate difficulties with that approach. If you find out please drop me a line and I’ll update the post with your findings. Thanks so much for your reply. Yes I would assume that the response rate would dive without a prompt. If we get to implementing I’ll be sure to check back in.